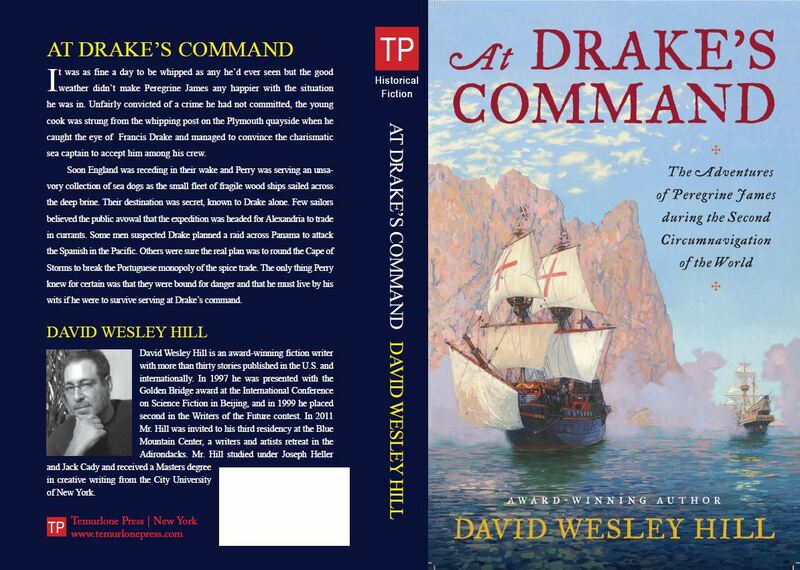 I was privileged to receive an advanced copy of At Drake's Command: The Adventures of Peregrine James During the Second Circumnavigation of the World, by David Wesley Hill, which tells the story of a young cook who joins an expedition under Francis Drake. The first third of the book is land based and does an excellent job of setting up the principal character, Peregrine James. The narrative quickly grabbed my attention and after that was hard to put down. It then follows the fleet as it heads for, and passes down the coast of, Africa, interacting with the Moors of Barbary. England at the time was seeking to get a foothold in overseas trade which at the time had been granted by the Pope to Spain and Portugal and which they fiercely defended. Attitudes at the time were sharply focused and the views and language of the time are reflected in the text. Books on Drake tend to focus on the Armada so it is good to see one that covers another period of his adventures. Having a cook as the principal character in an adventure novel is unusual but proved to be an excellent move. I won't spoil the plot by saying more but I soon got to like Peregrine. The novels' subtitle includes 'Circumnavigation of the World' so as I devoured the plot and was still off Africa I was certainly starting to hope that this was to be the first in a series and would not just have an abrupt ending. So when it ended with a major cliff hanger I was certainly pleased to see a note from the author that there will be a sequel. I am sure this series will educate me on an event in history I know little about. This book from Temurlone Press (where you can pre-order a copy autographed by the author) will be out in November 2012 and I highly recommend it. "The Golden Hinde off New Albion"
by Simon Kozhin, oil on canvas, 2007. Three vessels attempted the Straits. All made it through but the Elizabeth retreated to England and the Marigold sank with every hand in the Southern Ocean. Only the Golden Hinde continued the voyage, taking the Spanish treasure ship Nuestra Señora de la Concepción, charmingly nicknamed the Cacafuego—the Shitfire—and returning home with sufficient treasure to pay off the English national debt and to make millionaires of Drake and his investors. After being gifted with £100,000 in gold, a diamond cross, and a crown studded with emeralds, three as long as a finger and two round stones valued at 20,000 crowns, Queen Elizabeth knighted Drake on the deck of the Golden Hinde. Then the ship was retired from service and moored permanently at Deptford on the south bank of the River Thames, where she became a national tourist attraction. Pedestrian walkways were built around her for the convenience of spectators and the entire vessel was roofed over to protect her from the elements. For the next eighty years the Golden Hinde drew crowds of visitors from across the country eager to see the ship in which Drake had made his celebrated voyage. Eventually, though, time and rot and pilferage wore away at her. In 1662 the Golden Hinde was broken up. No trace of her remains today although according to rumor bits of her timber were used in the construction of certain items of household furniture. Tables in the Bodleian Library, Oxford, and in the Middle Temple Hall, London, as well as a chair in the great hall of Buckland Abbey, the estate Drake purchased with proceeds from the adventure, are all supposed to incorporate wood from the ship. Only one authentic picture of the Golden Hinde survives. This is an engraving on a coconut shell, currently in the National Maritime Museum, Greenwich, which Drake presented to the queen as a souvenir. Unfortunately, the carving lacks detail and little about the actual vessel can be learned from it. What is certain is that the Golden Hinde was a galleon, which is unsurprising since galleons were the marine workhorses of the 16th century. Their compact design allowed them to be used equally well as merchant ships and as military vessels. Most displaced less than 500 tons and carried three masts, two square-rigged and one lanteen-rigged. From their 15th-Century predecessor, the carrack, they inherited high forecastles and bulky sterns, which provided a ship's crew the advantage of elevation while battling another vessel at close quarters. The Golden Hinde, however, was race-built, after plans developed in France and promoted in England by Sir Richard Hawkins. This meant her fore- and aft-castles had been razored down, decreasing her windage, making her fast and agile, as well as better suited for naval warfare that relied on artillery rather than on hand-to-hand combat. Although a 100-foot ship may seem tiny today, when cruisers, cargo vessels, and tankers regularly exceed 1,000 feet in length, it is important to realize that the Golden Hinde was small even in her own era, particularly considering how heavily she was burdened and how many men she carried. In the 16th Century a merchant ship her size would have had a crew of less than twenty officers and sailors since then, just as in our own time, the cost of labor affected the profitability of any enterprise. More than sixty men, however, sailed aboard the Golden Hinde. This company included a dozen gentlemen adventurers, investors in the voyage and their relations, as well as soldiers and armorers; artisans such as smiths, coopers, carpenters, and sail makers; a troupe of musicians; a pastor; and additional sailors. All these extra men were needed not only for their professional expertise but as replacements for those expected to die during the voyage. They were also needed to man the cannon, which each required a gang of three or four men to operate efficiently. The heaviest and most bulky items—spare masts and anchors, cannon shot, several disassembled pinnaces, as well as the gold and silver looted from the Cacafuego—were stored in the bottom-most deck of the ship, the hold or bilge, where they acted as ballast and helped stabilize the vessel. The next deck up, just below the waterline, was the orlop, which held the hardware mentioned above and also the fresh and dried victuals for the voyage—barrels of salted pork, beef, and cod; rice, peas, walnuts, and sugar; biscuit and meal; vinegar, mustard, and spices; kegs of water, beer, and wine; and a menagerie of livestock and poultry. The upper-most full deck was the gun deck. Most of the space here was taken up by the massive eight-foot barrels of fourteen cannon known as demi-culverins. Despite being crowded with artillery, the gun deck served as the living quarters for the ordinary crew, the sailors slinging their Brazil beds—hammocks—between the cannon or sleeping on straw on the planking. It is possible that parts of the gun deck and the orlop were sectioned off into cabins by canvas partitions, since it is known that the Golden Hinde had both an armory and a smithy. At the front of the vessel above the waterline was the half deck known as the forecastle, which held two forward-facing cannon, bowchasers. The center of the ship, the waist, was open to the air and floored with grates instead of planks, allowing light and atmosphere down into the gun deck. At the rear of the ship was the afterdeck, which housed the grand cabin and Drake's personal living quarters. Finally there was the poop, also known as the roundhouse, a small cabin in which Drake and his officers relaxed in comfort during the long oceanic passage to Brazil. There is a scale replica of the Golden Hinde moored in London on the Thames, which I visited in 2009 while researching my novel about the circumnavigation, At Drake's Command. Although liberties were taken with the design—the replica possessed both a figurehead and a wheel instead of a whip-staff—in most respects meticulous attention was paid to re-create the original vessel exactly. Her hull was painted black and detailed with alternating bars of gold and scarlet, colors known to be popular with Tudor shipbuilders. The deck beneath my feet was painted red, too, as it would have been in Drake's time, in order to hide spilled blood. Walking the ship I had studied for so long, I began to understand the enormity of the achievement of the men who had sailed her. For three years they lived cheek to jowl in a claustrophobic wooden world surrounded by enemies, enduring storm and flat dead calm, foul water and rotting meat, the arrows of hostile Indians and Spanish lead—and yet they survived and triumphed. As I stood on the afterdeck beside the mizzen-mast, the very spot where Drake would have stood while commanding the vessel, I felt an obligation to these brave men and to this small ship to do my best to capture their story in words as truly as I was able. I also suspected it would be a challenge to find appropriate art for the book. It is a marketing truism that every historical sea adventure requires a sailing vessel on its cover. Since most maritime fiction is set during the Napoleonic era, the majority of nautical illustration depicts ships from later in time than the Golden Hinde, mostly ships of the line, the huge war machines that determined the international balance of power for centuries. I browsed through thousands of images without any luck but finally my eye was caught by a brilliant flash of blue sky under which sailed a galleon, her top canvas crossed in scarlet. Enlarging the thumbnail, I found myself looking at a historically accurate painting not just of a generic galleon but of the Golden Hinde herself. Titled “The Golden Hinde off New Albion”, the image is of a scene from a later point in the voyage of circumnavigation than encompassed by At Drake's Command—but who was I to quibble? I doubted I would find a more perfect picture for the cover of the book no matter how hard I searched. This was more than luck, I told myself. It was synchronicity. The artist, Simon Leonidovich Kozhin, is a graduate of the Russian Academy of Painting, Sculpture, and Architecture and a member of the Russian Realist school. He has had dozens of group and solo gallery exhibitions and his work is displayed in many museums and private collections both in Russia and in Europe. I was awed by the range of his subject matter—he is equally adept at portraiture as he is at painting landscapes and still lifes. I am grateful that Mr. Kozhin gave me permission to use his work on the cover of At Drake's Command. I am also thankful that he consented to answer a few questions about the painting. Hill: What inspired you to paint the Golden Hinde? Kozhin: At some point most children develop a passion for pirates and adventure stories. I developed my own interest in heroes and rebels while reading such fiction books as Captain Grant's Children [In Search of the Castaways], Robinson Crusoe, The Mysterious Island, Treasure Island, and The Chronicles of Captain Blood. As a child I used to play role games with my peers and we pretended to be pirates. When I was in my early twenties I created a board game for my friends based upon the plot of Treasure Island. Basically there were maps of a small part of England, where the novel starts, and of the treasure island itself. I drew the map by hand and used computer modeling software to create the key and indications. As a grown up I have kept my youthful dreams and still take pleasure in traveling and discovery. Nowadays I travel a lot, draw from life, and love to visit historical places. Commonly the natural space or the events that took place there shape my inspiration for my next picture. Hill: Why did you decide to paint the Hinde off the California Coast and not elsewhere? Kozhin: I found out that there is a Drake Passage between South America and Antarctica. I came across many photos of this rocky place, so that it was a starting point for the picture. The work on the picture took me no longer than a week. The most complicated task was to paint the water, since the reflections of the galleon and the rocks behind the ship were not convincing at the beginning. Hill: What research did you do to prepare for the painting? Kozhin: I’ve been several times to England. It is a country I enjoy visiting due to its traditions and customs. During one of my stays there, while going to museums, I became fascinated with the history of Sir Francis Drake and his voyage in Her Majesty's name, exploring the new lands, and decided to make a painting that would be based on Drake’s discoveries. I started reading books about him, painting sketches with ships, sea and rocks, studying the textures needed to create a picture. Thus, the idea of a painting gradually matured. I knew that there was a replica of the Golden Hinde in Brixham in the UK, and that it’s afloat. I found a model, photos, and drawings of the ship and used them to create the image. Hill: Where is the painting now? Kozhin: At the moment the painting is in a private collection in Changchun, Jilin Province, China. Thanks to an invitation from the Chinese government, I traveled there in 2009 with the exhibition. I did not sell the painting or its exclusive copyright. Before this, in 2006, the painting was printed as a postcard by Maytree Cards and is still sold in Britain. Hill: Could you give a brief summary of your career. Kozhin: I hope that my artistic career is growing, since the age of 30‒40 is considered among artists as the most fruitful. I work a lot, take part in personal and group exhibitions, and publish my work in various books and media. I am fond of traveling in Russia and abroad. Hill: Are you planning on doing any more nautical paintings? Kozhin: I have some ideas concerning paintings on pirate and sea adventure themes. This summer I visited many places with fortresses that would serve as brilliant blueprints for such a topic. The World Encompassed and Analogous Contemporary Documents concerning Sir Francis Drake's Circumnavigation of the World, ed. N. M. Penzer (New York: Cooper Square Publishers, Inc., 1969). Sir Julian S. Corbett, Drake and the Tudor Navy (London: Longmans, Green and Co., 1898). New Light on Drake, ed. and trans. Zelia Nuttall (Liechtenstein: Kraus Reprint Limited, 1967). Henry R. Wagner, Sir Francis Drake's Voyage Around the World, Its Aims and Achievements (San Francisco: John Howell, 1926). E. G. R. Taylor, "More Light on Drake", Mariner's Mirror, Volume 16, Issue 2 (1930), pp. 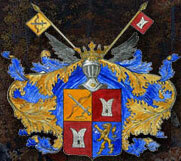 134 – 151. F. C. Prideaux Naish, “The Mystery of the Tonnage and Dimensions of the Pelican-Golden Hind”, Mariner's Mirror, Volume 34, Issue 1 (1948), pp. 42 – 45. Francis Drake - Privateer: Contemporary Accounts of Drake's Early Voyages, ed. John Hampden (York: Methuen Publishing Ltd, 1972). David Wesley Hill is an award-winning fiction writer with more than thirty stories published in the U.S. and internationally. He studied under Joseph Heller and Jack Cady and received a Masters in creative writing from the City University of New York, as well as the school's highest literary prize. In 1997 he was presented with the Golden Bridge award at the International Conference on Science Fiction in Beijing, and in 1999 he placed second in the Writers of the Future contest. In 2007, 2009, and 2011 Mr. Hill was awarded residencies at the Blue Mountain Center, a writers and artists retreat. His critically-acclaimed sea adventure, At Drake's Command, is available in paperback and for Kindle on Amazon. The sequel, Desperate Bankrupts, will be available soon on-line as a thrilling serial.